Propane is clean-burning and safe to use indoors because of its gaseous state and simple chemical structure. A propane forklift carries its fuel in a sealed, pressure-tight system, eliminating a significant source of secondary pollution found with gasoline- and diesel-fueled forklifts.Propane forklifts operate with emissions well below standards set by the Occupational Safety and Health Administration (OSHA) when properly maintained. A study by Mark Delucchi of the University of California – Davis Institute of Transportation Studies reported that LPG (propane) forklifts can offer significant reductions in emissions of indoor and urban air pollutants, especially compared with gasoline and diesel.Propane-powered forklifts outperform electric forklifts in indoor and outdoor applications. They consistently demonstrate the ability to lift, push and pull heavy loads at full capacity, up and down inclines, for a longer time and with improved ground speed when compared with electric lifts.Propane-powered forklifts provide consistent power 24 hours a day. Compressed natural gas-powered trucks take six hours to refill after as little as two hours of operation, and electric forklifts can take up to eight hours to recharge. It takes only five minutes to change a propane cylinder.Propane-powered forklifts have a cost advantage over electricity-, diesel- or gasoline-powered lifts. Propane forklifts have a lower purchase price and studies show that they require less maintenance over time.Propane-powered vehicles have less carbon build-up than gasoline- and diesel-powered vehicles. Spark plugs and engine oil last much longer contributing to propane engines lasting up to twice as long as gasoline engines do. Properly maintained propane-fueled forklifts operate with emissions well below the Occupational Safety and Health Administration (OSHA) standards. Farmers using propane-gas flame weeders have reported higher yields per acre by using propane. Propane gas flamers can provide 70 percent to 90 percent control of wintering adult insects compared with 25 percent to 50 percent provided by chemical pesticides, and propane flamers cost three to five times less per acre than chemical controls. Propane drying systems are widely used because of the simplicity of the required equipment, which contributes to low equipment, fuel and maintenance costs. Propane-fueled irrigation pumps produce the same amount of power as gasoline or diesel engines, with lower emissions. Propane will not leave a dangerous and sometimes toxic residue, as liquid fuels can. Infrared propane brooders have proven to be more efficient and stay warmer with less heat than forced-air furnaces. Fuel costs are also 15 to 25 percent less than those for forced-air furnaces. Propane heaters operate efficiently for long periods while producing enough heat to prevent valuable crops from being ruined by unexpected cold spells. Propane is also used in heating greenhouses. Studies show that tractors fueled by propane can have lower major overhaul costs than gasoline-powered tractors, and sometimes, engine life is prolonged. Some gasoline-powered tractors that are converted to propane have an increase in power. In a properly modified engine, farmers report the ability to pull larger equipment than before, because propane has a much higher octane rating than gasoline. Propane gas is nontoxic and insoluble in water, so it poses no threat to aquifers or the groundwater supply.Propane is an approved, alternative fuel listed in the 1990 Clean Air Act. It is one of the lightest hydrocarbons in existence, and is one of the cleanest burning of all alternative fuels.Propane is the most portable alternative fuel. Storage tanks can be placed around the main farm area or in the field. Tanks can also be moved with the work site, allowing farmers to power equipment in even the remotest areas of a farm. Propane autogas is an ideal alternative fuel for many fleet managers because it offers the power, performance, and operating cost advantages they need. There are a number of light-duty propane-autogas-powered vehicles on the market. These vehicles contain engines ranging from 3.7 liters to 6 liters in size. 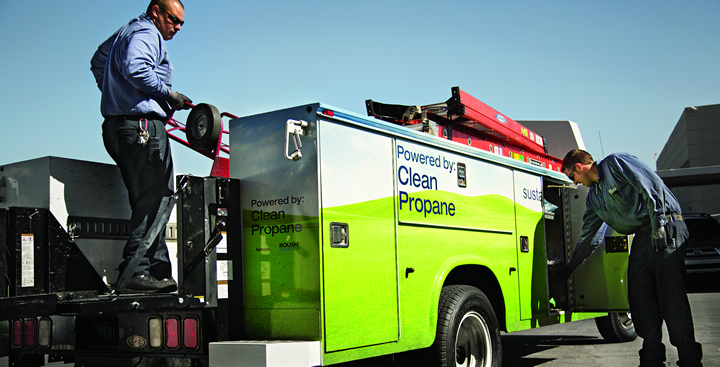 Propane-autogas-dedicated light-duty trucks and vans are backed by leading OEMs and are EPA- and CARB-certified. The list of medium-duty propane-autogas-powered vehicles is growing every day. Fleet managers can choose from an array of propane-autogas-dedicated EPA- and CARB-certified options, including shuttle buses and trucks.